Arsenal Supporters’ Trust recently revealed their financial analysis of Arsenal Holdings PLC, which will release its financial figures, soon. I am not a commerce expert myself. Hence, I try to make it more of a layman language analysis for you here. I have also included some other stuff which happened recently. 2) How much did player sales bring in to the club? That means, the club received a total of £66m million in initial payments on the players that were sold. 3) How much profit was made on the players sold? Now, some of the players who were sold, were on contracts such that they would be free agents soon. Hence, their value would have been considerably reduced. Arsenal made a profit of £55m on player sales. 4) How much was spent on new players? Arsenal spent a total of £54m on new players. 5) What are the additional costs on player dealings? Add to the above transfers, £6m in amortisation charges (which is basically accounting and contract charges), plus agent’s fees, plus the contract renewals of players like Vermaelen, the total additional costs mount up to £10m. 6) How much revenue did the club generate? Revenues are subject to the performance of the club in the competitions such as the Champions League and the FA Cup, because the Premier League more or less, remains the same. 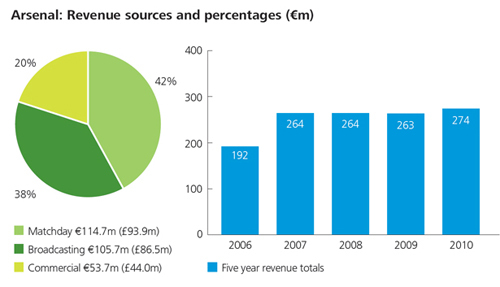 According to the Deloitte Football Money League, the club had revenues of £224m. 7) How much improvement is that from previous years? There was an improvement of £10m in revenue from the previous year, where revenues were recorded at £253m. 8 ) How is the revenue broken down? 9) Which areas have the revenues changed in? 10) Despite the early exits in competitions, how have the revenues improved? i) Ticket prices were increased by roughly 4%, hence generating £4m to the club. ii) The Asia tour was a success, raising the club £3m. 11) Where have revenues taken a hit/ Where could the revenues take a hit? The Premier League Merit Payment Scheme, means the clubs are paid depending on their league position, according to which their matches are broadcasted across the world. Now, while Arsenal had 22 matches live last time, the number has fallen to 17. This has cost the club £2-3m. 12) What is preventing the club from making bigger commercial revenues than other clubs? Arsenal have signed a stadium sponsorship deal with Emirates, upto 2020/2021, which amounts to £90m. This partnership also includes kit sponsorship deal till 2013/2014. Moreover, the club signed a new and improved kit contract with Nike. These long term deals means a substantial decrease in commercial revenue on the short term. 13) How much is the net change to costs? Considering the fact that the club spent £3m approx., to cover Stan Kroenke’s takeover, and that money will be regained from summer games and pre-season games, and that the player salaries of the players who left, is slightly in excess by the new players, and will gobble up the £10m revenue profit, there is no net change in costs. 14) How much cash is due to the club? Arsenal is yet to receive a sum of £35m for Queensland Road and Hornsey Road. However, this will effect only from the next financial year. 15) How are the financials affected this season? Now, revenues are calculated according to two time-periods. One is from December to May and the other from June to November. Now, as there are no matches during June to August, the revenue generated from June to November was less for the 2010/11 season. While £98m was received from the period June to November 2010, it rose to £127m during December 2010 to May 2011. Now, since there have been more home games in the first half of the season, the club has generated £113m, which is £15m more from the previous season. 16) How much overall profit before tax has been generated? A total of £45m overall profit has been generated. 17) Can the profit be used for strengthening the squad? No. It is because of the timing of receipt of the money, and also for repaying the amount that was used to build the new stadium. 18) So, how much boost is there in the cash reserves? £25m boost from property sales. However, ticket money was received later and sponsorship received in advance fell by £25m. Hence, the year end cash figure comes up to £160m. 19) Where does the £160m go? i) £32m for future stadium repayments. Which is a total of £114m. 20) So, how much do Arsenal have with themselves to spend? After the above deductions, the club has £46m. Add to this net proceeds of summer transfers of £14m. Minus the agents fees, contract renewal fees, around £10m. Hence, the club has £50m ‘to spend or to save on a rainy day’. 21) How high is the club’s wage bill? The wage bill of everyone employed with Arsenal Football Club comes up to £130m. This is the 4th highest in the Premier League, behind the likes of Chelsea, Manchester City and Manchester United. 22) How much will not qualifying for the Champions League affect the club? Not qualifying for the Champions League will cost the club a sum of £45m. ii) It will affect on keeping players, for eg Robin van Persie, who will be reluctant to sign a new contract if the club fails to qualify for the UCL. iii) General seat sales will be affected. Lower prices will be put into force, and lower attendances for Europa League games. iv) It will affect future sponsorship’s of the club. Shirt sponsorship and kit manufacturers currently yield £14m every year. Both these deals will be up for renewal in 2014. 24) Does the club have a safety net to cover the above losses? Yes. The club has £50m cash surplus. Add to that pending payments of £35m. 25) Finally, what questions will be raised by the Arsenal Supporters Trust, to Stan Kroenke and the club in general? i) Most Arsenal fans feel that funds were withheld for spending by the manager. Is it true? Is the club holding him back, as a back up incase Champions League qualification is not secured? ii) £130m is the current wage bill, considerably higher than that of fierce rival Tottenham, who are now 10 points ahead in the Premier League. Hence, the wage bill is not justified by on-field performances. Moreover, there are too many players, who are not good enough for the first team on the payroll. Is the club doing enough to address this issue? iii) In the face of reduced revenues, which will make the club yield losses, is the club looking at other sustainable financial options, to be compliant with the Financial Fair Play rules, which come into effect in 2014? v) If the club qualifies for Europa League, the ticket prices should be reduced. vi) Improvements in Ticket Exchange Facility, to reduce empty seats during games. 26) Who are the current shareholders in the club? i) The largest shareholder is Stan Kroenke, who owns 66.76% of the club. ii) Red and White Holdings, co-owned by Alisher Usmanov own 29.25% of the club. iii) Minority shareholders, including former players and AST itself, own 4% of the club. 27) Rangers, who went into administration recently, sold Usmanov ‘historic shares’. What exactly does that mean? Glasgow Rangers have owned a stake in Arsenal for over a century now. In 1910, when Arsenal was going through financial turmoil, Rangers had purchased 2 shares. When Arsenal became stable enough, further 14 shares were gifted to the Scottish club. What happened was, Craig Whyte, the owner of Glasgow Rangers, decided to sell these shares to Alisher Usmanov, who duly obliged, in the midst of the financial crisis at the club. Now, Usmanov’s stake has risen from 29.25% to 29.63%, hence closing in on the 30% mark. More information and detailed analysis of Usmanov’s position can be found, well articulated in Angry of Islington. 28) Why, in general, Arsenal fans feel Usmanov is a better owner than Kroenke? In what seems to be another USA-Russia cold war brewing, disgruntled Arsenal fans seem to be on the Russian side. This is because, the club looks like it will go 7 years without a trophy now, since the FA Cup win in 2005. They feel Kroenke, is here just for the money, and is using the money he generates here into his American sports sides, which are NFL team St. Louis Rams, NBA’s Denver Nuggets, NHL’s Colorado Avalanche, National Lacrosse League team Colorado Mammoth and MLS side Colorado Rapids. As you can see, he has a vast sporting empire in the USA, in a variety of sports. Fans feel that Usmanov has better knowledge of the game and will be willing to fund some big transfers to the club, much like the model followed by Chelsea and Manchester City. Usmanov’s net worth is US$17.7 billion, compared to Kroenke’s US$3.2 billion. Arsenal is committed to its mission of financial self sufficiency and has a strong and stable business model. Its investment in its stadium has provided the business with a solid foundation. In the longer term, if its strategy of pursuing international commercial development is successful, it could provide The Gunners with a financial strength matched by few clubs. Previous: Get behind your team and your manager! Next: Spu*s Preview + Team News + Loads of Other Stuff..